Growing up in Illinois, I didn’t get to see my grandmother much. She lived in the middle of Kansas, smack dab in the middle of the American breadbasket and frontier history. My first memory of visiting her was when I was six-going-on-seven. Her home was the clean and cozy environment one would expect from a widow who had been a farmer’s daughter, wife, and mother — with family photos and a collection of toys and comic books quite unlike anything I had in my own toy box. Two things stood out from the first day I walked into her house: a plastic cup with my name written on it (mixed in with other cups of the names of my cousins), and a homemade pillowcase on the guest bed with my name sewn onto it. These were not gifts. These were items for me to use while I was visiting her; items that would remain there after I left — so that the next time I visited, they would be available to me again. My suspicion is that after I returned home, those items would be washed and put away in her very organized closet — to be pulled out the next visit. And so they did, every time I visited, well into my adulthood. …Fast-forward about a thousand years. Some people think I’m single, when I’m really I am polyamorous with three partners (plus a larger network of friends), and I live alone. There are pretty significant differences between those ways of life, as any poly person would recognize. But sometimes it’s the little differences that swoop in under the radar. For instance, I have to buy 36-packs of toilet paper significantly more frequently now than was the case when I was “single” in the conventional sense (unpartnered). Also, I keep several kinds of body wash in my shower, and I own things that I myself don’t use (like bottles of lotion). And I wash bedsheets and towels much more frequently. Recently, I was consoling one of my partners, who had broken up with a boyfriend in whom she had invested significant energy and emotion. She was wrestling with the need to get a few things back from her ex-boyfriend’s apartment — items which she’d left there because she used to visit him frequently. In contrast, whenever she visited me, I did my best to make sure she didn’t leave anything behind — particularly anything important that she might need. It wasn’t that I didn’t want her crap in my house; I just wanted to ensure she wouldn’t have to go to the trouble of returning for things, or go out of her way to buy an extra razor, hairbrush, etc. At the time she lived about 90 minutes from me, which would have been pretty annoying for her. I believed this practice reflected personality traits we shared, since we both were raised to be frugal. Unfortunately, a little while later I found out her perspective on this habit of mine was completely different. Sometime after she got her stuff back from her ex, she told me that she did not feel like we had the kind of relationship where she felt welcome to leave stuff at my house. She said she always felt like a houseguest. This was quite a shock to me. I had always felt (but perhaps I hadn’t said it loudly enough) that she was always welcome in my home. Even if I have guests, or other plans, or I’m out of town, she could stay at my house whenever she needed. I have a spare bedroom, if space was an issue. She even has a key! I thought, “How could she feel unwelcome?” But even if her feelings seemed irrational to me, that didn’t matter. Her feelings were valid. We discussed this, and I processed this disparity between our attitudes for a few days. Several months earlier I’d come up with the idea of having monogrammed towels for each of my partners, but hadn’t pulled the trigger on it. So I went to a home goods store, spent a few bucks, and gave this partner her own space in my home. I also created similar space for each of my other partners. In a special closet in my home there now sit three baskets. 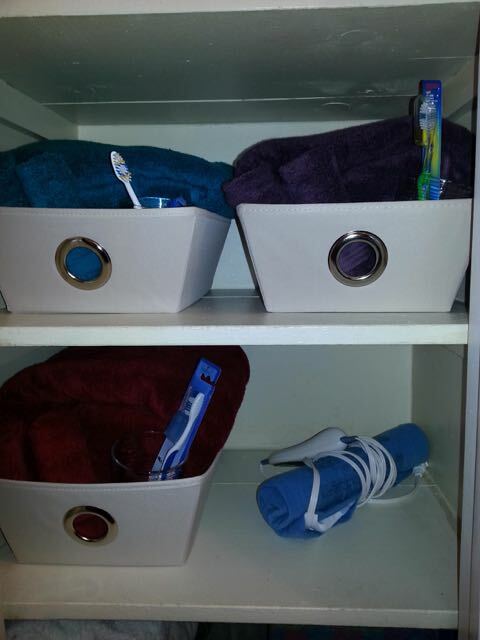 Each contains a bathsheet, a hair towel, two wash cloths, a tumbler, and a toothbrush. These items are color-coordinated rather than labelled — they matched necklaces that I had made for each partner based on colors that I knew they liked or wore often. I posted a picture and shared it on the Reddit polyamory forum. That received some great comments. I learned that other poly people have found similar solutions — such as a plastic drawer set dedicated for their partners’ belongings. These spaces hold items accidentally left behind, or they might be a permanent container so that visiting partners don’t always have to pack so much stuff. Some commenters suggested that the baskets might also be a good place for my partners to leave gifts or notes for each other. “Red Towels” felt “appreciation and delight at knowing that I was thought of. It’s a nice place to feel ‘at home’ in a place that’s not my home.” Note that earlier I had brainstormed ideas with her — “Just give us a closet!” she said. So she was also pleased to know that I valued her advice and input. This isn’t just about each of them having their own things in my space — it’s a tangible reminder that each of them is always welcome in my home. That my partners mean more to me than just occasional houseguests. It’s like the consideration my grandmother showed all of her grandchildren when she washed their cups: my partners are always on my mind, even as I take refuge in my solitude. A great idea for a common situation! What I liked best about this wasn’t the specifics, but that you outlined the process and discussion and *compassionate* compromise involved in arriving at the end solution. It would be relatively straightforward to say “blue towels girlfriend doesn’t feel as attached to me because she doesn’t leave stuff here. That’s her feelings and she should own them and I have no responsibility in this” Well, all that is true, and you don’t have responsibility, but compassion leads to wanting to arrive at a solution which isn’t just about minimising the cost to self but about maximising the happiness of all involved, imho. Can I do something that will not compromise my need to be solopoly, yet will help her with her feelings? I have a box for the sweetie that visits most often and tends to leave stuff – for me it helped not feel crowded by his stuff, yet as you said, meant he didn’t have to bring stuff each time he stayed, and allowed for spontaneous sleepovers. We’ve been together 4 years and both happy with our independence within our setup. I don’t like that framework of “your feelings are yours to own, fullstop” because people are people, glorious, complex and with evolving feelings and needs.